Face in Symbol Technology is Here! 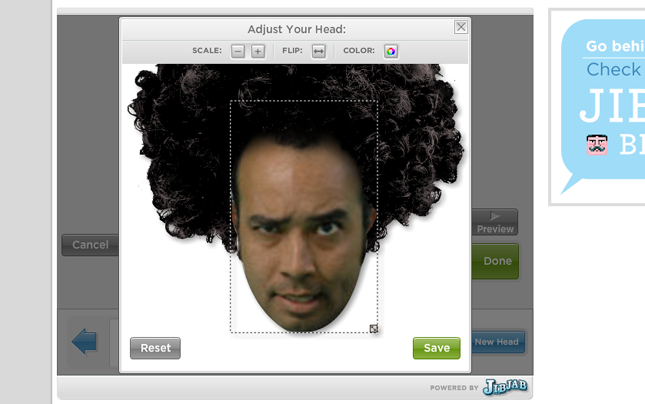 Along with the launch of our massive array of Soul Train videos, we’re proud to announce the addition of Face in Symbol Technology at JibJab! What does this mean for you? Right now it means afros! With each Soul Train video you have the ability to affix an afro to your head like Jamie, pictured below. He was just one of the many ingenious folks on our team who helped us pioneer the technological feat of fro that you see on the site today. We’re going to be using this ability in a LOT of new and interesting ways over the next year, just wait until you see what our artists have in store for Halloween! This entry was written by paulhanges and posted on September 9, 2009 at 5:41 pm and filed under New Content, Team JibJab. Bookmark the permalink. Follow any comments here with the RSS feed for this post. Trackbacks are closed, but you can post a comment. could you put this technology in all of your E-cards? A lot of them don’t come out right because I can’t position the heads. why do the lines around the mouth always show in the completed video? Whether I animate them or not…I’ve tried both ways. How can I get rid of the mouth positioning lines in the actual video? ?